​I live in Saint Peter, and I drive to Willmar several times a year for various meetings and family gatherings. I typically drive west on Nicollet County Highway 1, and then head north onto State Highway 15. At the intersection of these two highways, I can see the small city of Lafayette to the northwest. From the intersection, the city appears to consist of a huddle of trees, a small water tower, and a gas station in the center. As someone who grew up in the Twin Cities and who has lived in even bigger metro areas like Chicago as an adult, small towns in rural settings are often a mystery to me. What goes on there? Where do people gather? Where do they work? Do they have to drive long distances just to get to a store? Before my time in CNC, Lafayette had been little more than a place to turn. The Connecting Nicollet County program introduced me to a vital community beyond the intersection. Our group visited the Church of St. Gregory the Great, a Catholic church with a fascinating history. We toured the Lafayette Charter School, a warm place full of lovely people, where I would happily send my child if we lived nearby. Most impressive to me was our tour of the United Farmers Cooperative. Spanning several large buildings, this business is a hive of activity and agricultural technology. UFC plays a huge role in our county’s rural economy, a role that is much bigger than I understand, even today. Discovering that Lafayette is indeed brimming with community services and growing businesses that serve national and even international markets challenged my old assumptions about small-town life. CNC educated me, and for this, I am thankful. 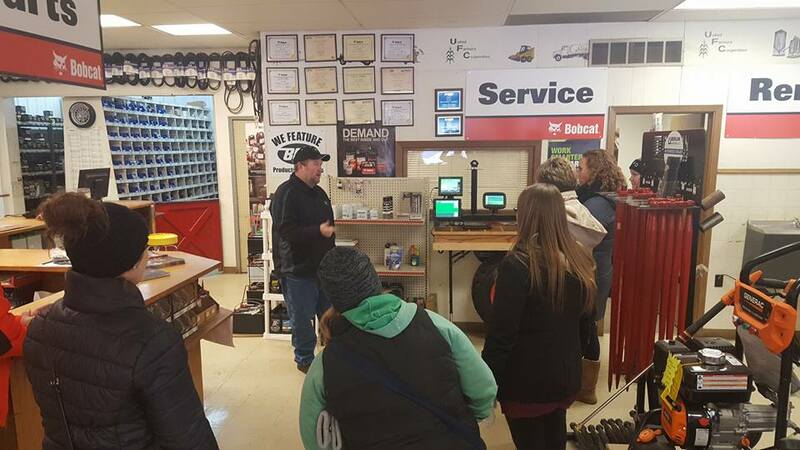 Connecting Nicollet County class members meeting with the head of the precision agriculture department at UFC in Lafayette.